The Alamo Heights ISD Board of Trustees named Dr. Dana Bashara as the lone finalist for the position of superintendent. Dr. Bashara is currently the Assistant Superintendent for Elementary Education for the district. Bashara will assume the duties of superintendent after the state-mandated 21-day waiting period. During her role as Assistant Superintendent, Dr. Bashara led the District Education Advisory Council, which developed the Profile of a Learner, the framework for the district’s strategic plan. For the past eight years, she also chaired the District Design Team, which has helped transform numerous district-wide programs including: Showcase of Engagement, Ambassadors for Education, and the district’s Professional Development program. Dr. Bashara also led the partnership with Engage2Learn for the roll out of the AHISD Engaged Classroom initiative, the Teacher Leader Academy, and the AHISD Dual Language Program, which is regionally acclaimed as a model for elementary and secondary effectiveness. Prior to her role as Assistant Superintendent, Dr. Bashara served as Director of Personnel and Public Information where she was a key leader in the district’s strategic planning process, made significant improvements in the human resources department, and initiated the development of a district communications department. 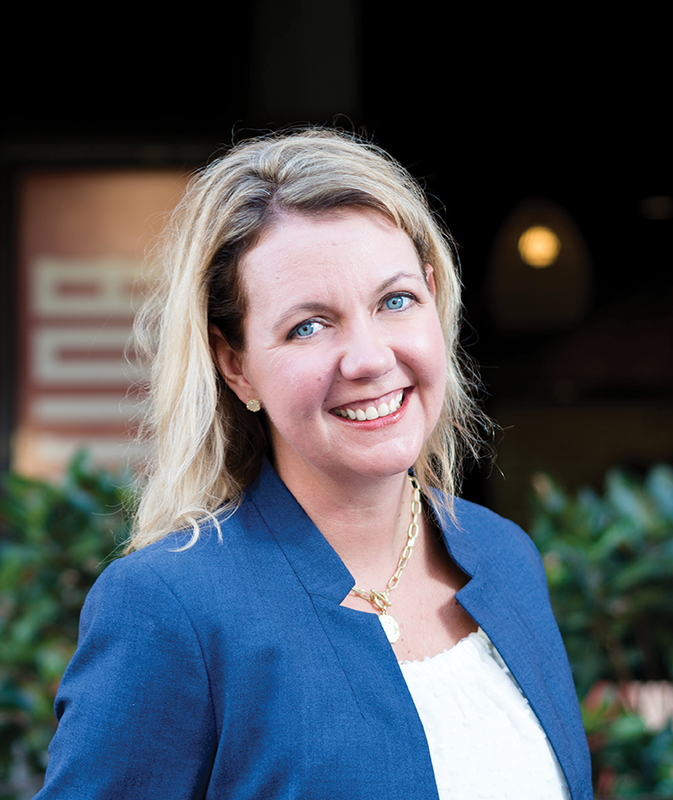 Prior to that, Dana served as the Principal at Cambridge Elementary School (2003-2006), Assistant Principal at Cambridge and Alamo Heights Junior High School (1999-2003). She began her career in the district as a fifth grade teacher at Woodridge Elementary. Raised in Pittsburgh, Pennsylvania, Dana graduated from Baldwin High School in 1992. Dana earned her Bachelor of Science degree in Psychology as well as her K-8 Education Certification in a double major program at Allegheny College. She completed her Master of Arts in Educational Leadership in 1998 at the University of Texas in San Antonio. She completed her Doctorate in Educational Administration at Texas A&M University in 2008. She is married to Collier Bashara, a former AHISD graduate who was a student at Cambridge Elementary, AHJS, and AHHS! Dana and Collier have three daughters, Sadie Mae, Ainslie and Addison, and a son, Grady, all students at AHISD. Dr. Bashara has earned numerous awards and recognitions during her career in the district. The Texas Elementary Principals and Supervisors Association named her 2013-2014 TEPSAN of the Year. She received the Yellow Rose of Texas Education Award for outstanding contributions to leadership in education from the Constance Allen Heritage Guild. And most recently, the San Antonio Business Journal named her a Woman in Leadership Award Recipient in 2017. For more information about the search process, visit AHISD’s webpage: www.ahisd.net. It started out like any other school day. Preparing for the day ahead. His students set to continue designing and building their tornado probes, one of his annual lessons in meteorology and severe weather. He intentionally places the lesson in the spring of each school year so he, with direction from his students, can storm chase in an effort to launch the student-built probes in an effort to gather information that may one day help more efficiently predict when a tornado will strike. Both he and his students hope their work in their 7th and 8th grade classrooms will possibly save lives one day. That is just one of the many lessons taught in a day at Alamo Heights Junior School in Jeff Wheatcraft’s STEM classroom. He designed the program from scratch, with the goal of having students explore science through the lens of exploration, fabrication, and discovery. Three words are posted on his classroom door: Autonomy, Mastery, and Purpose, and they guide his goal to teach students not what to think, but how to think while helping them find purpose in the educational setting. Wheatcraft was named Alamo Heights ISD’s Teacher of the Year, in early spring. He was one of nineteen educators honored by Trinity University recognizing truly outstanding public-school teachers. Wheatcraft was named the Trinity Prize Recipient for Secondary Education, earning the coveted Tiffany Crystal Apple Award and a check for $2,500. Soon after, Wheatcraft was named Principle Auto’s Car-4-All-Seasons Teacher of the Year. Earning the privilege to drive a new car for each of the four seasons, was a huge treat for Wheatcraft, as he currently uses his personal vehicle to storm chase. It has been hit with hail during a few chases, so riding to school each day in a beautiful Principle Auto vehicle is a privilege he is grateful to enjoy! He shares that the Car-4-All Seasons will not be going on any of his storm-chasing field trips! Shahbaz Hashmi was selected as the grand prize winner of the Wells Fargo Succeeding Together essay contest, administered by Wells Fargo and The First Tee program, which he has been a part of since the age of three. His grand prize essay discussed the positive influences of the Alamo Heights Varsity Golf Team, which he considers his “go-to team”. 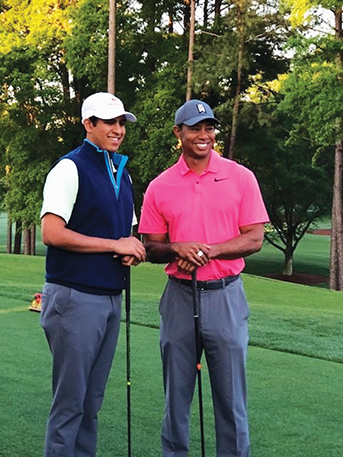 As the grand prizewinner out of thousands of applicants, Shahbaz had the opportunity to play in the Pro-Am tournament of the Wells Fargo Championship at Quail Hollow Club in Charlotte, NC with the professional golfer of his choosing. Shahbaz played alongside Tiger Woods, and together they won the Pro-Am with a 15-under par 56, the first Pro-Am win of Woods’ career. Shahbaz is a coach and mentor of young participants of The First Tee of Greater San Antonio and is a co-founder and the President of the program’s Junior Advisory Board. 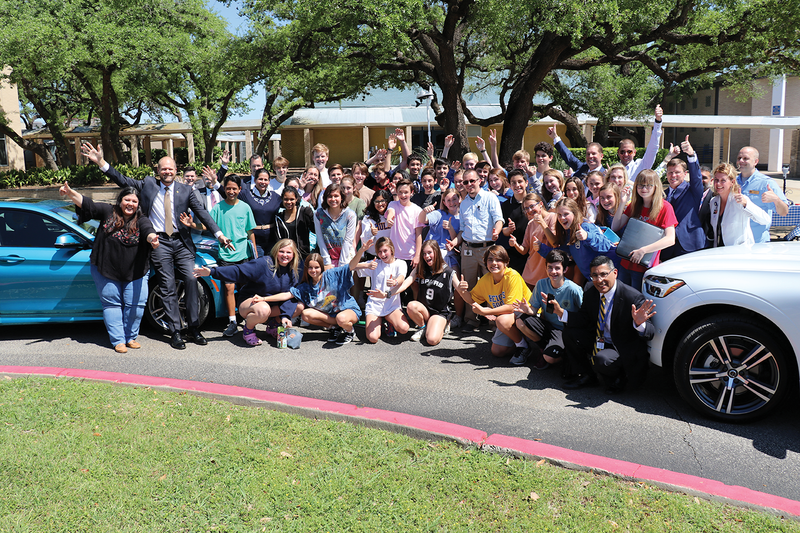 The Alamo Heights High School Choirs sent ten soloists and one ensemble to compete in the UIL Texas State Solo and Ensemble Competition in late May and all received either a Superior (1st division rating) or an Excellent (2nd division rating). Those receiving a medal for their 2nd division solo were: Raquel Alicea, Travis Butts, Olivia Eguia, Heidi Hill, Ari Rodriguez and Destiny Thomas. Those receiving a medal for their 1st division solo were: Diego Cruz, Morgan McGinnis, Audrey Nicholson and Presley Weber. The following also received a 1st division rating on their ensemble: Raquel Alicea, Diego Cruz, Audrey Garcia, Audrey Nicholson, Katie Kaufmann, Morgan McGinnis and Destiny Thomas. Congratulations to these outstanding state performers. 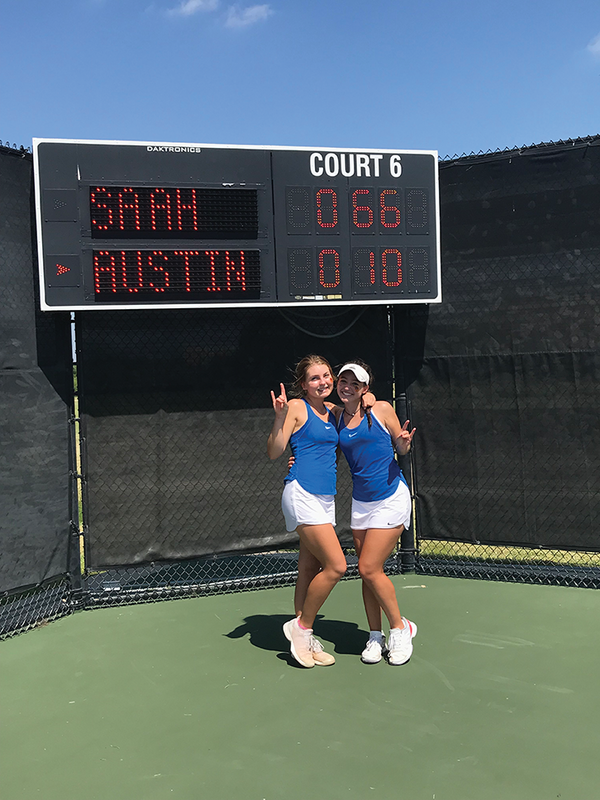 Congrats to Alamo Heights High School’s Campbell Irwin who took the silver medal at state in the Boys Tennis Singles competition and to Fiona Crawley and Brianna Wilbur for earning the gold in Girls Tennis Doubles during the UIL Tennis Championships at Texas A&M’s Mitchell Center in College Station! 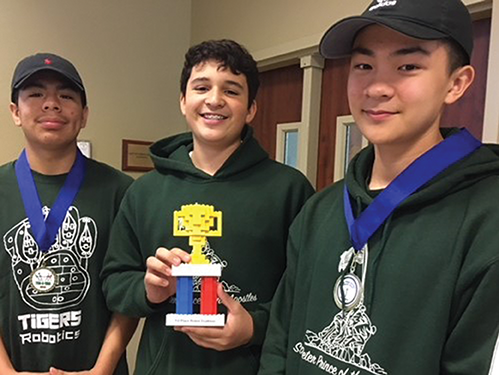 Students at St. Peter Prince of Apostles Catholic School have spent much of the year preparing for various contests and competitions in academics, robotics, and fine arts and their efforts have resulted in a number of accolades. Throughout the year, robotics students designed, built, and programmed their own robot. On May 19, these students competed in a Robotics Triathlon at Sts. Peter and Paul Catholic School in New Braunfels. During the event, robots from each team squared off against one another in a joust, tug ‘o war, and drag race. 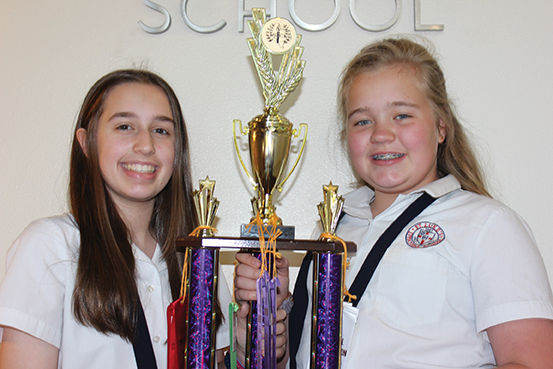 Eighth grade teams from St. Peter’s claimed first and third place overall. On May 8, the Archdiocese of San Antonio announced the winners of the annual Cup of the Spirit, an award presented to a school at the elementary and middle school levels for their combined performance in four events held throughout the year as part of the Catholic Arts and Academic Competition. The events included the Cheer 4 Christ contest, the STREAM challenge academic event, the Creative Arts contest, and the Sing at the Cross choir competition. The performances of St. Peter’s middle school students in various events at these competitions earned them 3rd place overall among schools in the Archdiocese. On May 5, students participated in the academic and arts contests at the Central Catholic High School Quiz Bowl in events that tested their knowledge and abilities in a variety of subjects. The team won 16 awards including two Honorable Mentions, seven 3rd place, three 2nd place, and four 1st place finishes in Current Events, Number Sense, and Drawing. In the Drawing event, the 7th and 8th graders combined to win seven of the top eight awards. The Saint Mary’s Hall 2017-2018 Speech and Debate team has taken the top honor at two very prestigious competitions that include both public and private schools: The Texas Forensic Association (TFA) State Championship and National Individual Event Tournament of Champions (NIETOC). The Speech and Debate team was awarded first place in the TFA State Championship, with the speech team winning the NIETOC Team Sweepstakes. This marks the second time in three years that the team has won the State Championship and the first time ever to win the NIETOC Championship. In addition to their competitive success, the team was honored with the TFA Community Service Award for their work in supporting the San Antonio Food Bank in their continuing efforts to combat hunger, as well as support the Hurricane Harvey relief efforts in the Gulf region. “The success of our Speech and Debate Program is a testament to our students’ hard work. They have attended 31 tournaments this year and their dedication is something we are all very impressed by and proud of. The future is indeed bright for these talented actors and speakers,” said Director of Fine Arts at Saint Mary’s Hall Bethany Bohall. The students build on their talent through hard work, beginning (for most of them) in the Saint Mary’s Hall Middle School. Last summer, the National Speech and Debate Association (NSDA) National Tournament named the Saint Mary’s Hall Middle School Speech and Debate Program as a “Middle School of Excellence,” which is a distinction reserved only for the top five middle school speech teams in the nation. “The team works hard and we all have to be dedicated, not just to doing our best, but supporting each other as well. It’s like my second family and we work in an atmosphere of love. Being with this group has afforded me so many wonderful opportunities and memories that I will cherish for years to come,” said senior Drake Leach, who won 1st place Individual Sweepstakes at the NIETOC competition. Upper School Debate Teacher Colin Malinak, Speech and Drama Teacher Joe Muller, and Middle School Speech and Drama Teacher Rachel Warnecke are currently at work preparing their students for the NSDA Tournament in Florida this June. The Junior Classical League is a competition, which covers all aspects of the Classical world, including Latin. Over the weekend of April 13th, middle school students from SLES competed at the state level, with two students taking top honors in their individual categories. Elise Miles, placed first in Mythology and Miley Hamilton placed first in Roman Life. In total, St. Luke’s received 15 awards and overall, followed up their 3rd place in the region with 9th place in the state. Gratias Maximas to the SLES students for being scholars, citizens and leaders, as they represented themselves, St. Luke’s and San Antonio with distinction!